Photo from the 'Sgt. Pepper's Lonely Hearts Club Band' album. Credits: ©Apple Corps Ltd.
Fifty years ago today (June 1), The Beatles released their album 'Sgt. Pepper's Lonely Hearts Club Band,' which included the iconic song "Lucy In The Sky With Diamonds." The popular song was critically acclaimed for evoking a surreal dreamscape, along the lines of Lewis Carroll’s classic "Alice's Adventures in Wonderland" fantasy. John Lennon said it was inspired by a drawing his son Julian — then age 3 — had made of a nursery school classmate named Lucy. Fast forward to Nov. 24, 1974, when, during a fossil-hunting expedition in Hadar, Ethiopia, anthropologist Donald Johanson and a student decided to take an alternate route back to their Land Rover through a nearby gully. There, Johanson discovered a fossil forearm bone and quickly identified it as a species of hominin, a human ancestor originating after the evolutionary split from the ancestors of apes. Shortly thereafter, he saw an occipital (skull) bone, then a femur, some ribs, a pelvis and the lower jaw. Two weeks later, after many hours of excavation, screening and sorting, several hundred fragments of bone had been recovered, representing 40 percent of a single hominin skeleton. Later that night, there was much celebration and excitement over the discovery of what looked like a fairly complete hominin skeleton. There was dancing and singing; The Beatles’ song "Lucy In The Sky With Diamonds" was playing. At some point during that night, expedition member Pamela Alderman named the skeleton "Lucy," and the name stuck. Jump ahead to 2013, when a proposed NASA mission to explore Jupiter's Trojan asteroids was in search of a name. While most NASA missions are acronyms, this particular mission took a different path. Planets were built from solid materials orbiting the sun that came together under their mutual gravitational attraction. Primitive, volatile-rich bodies like the Trojans — in swarms ahead of and behind Jupiter in its orbit around the sun — are fossils of these first planetary building blocks and hold valuable clues to how the planets formed. Earth's oceans and atmosphere may have been supplemented by impacts from primitive bodies similar to the Trojans, so these fossils may help reveal our most distant origins. That link to our beginnings inspired the mission's principal investigator, Harold Levison of the Southwest Research Institute (SwRI), Boulder, Colorado, to name the spacecraft after the Lucy fossil. The connection to The Beatles' song was the icing on the cake. "These asteroids really are like diamonds in the sky in terms of their scientific value for understanding how the giant planets formed and the solar system evolved," said Levison. 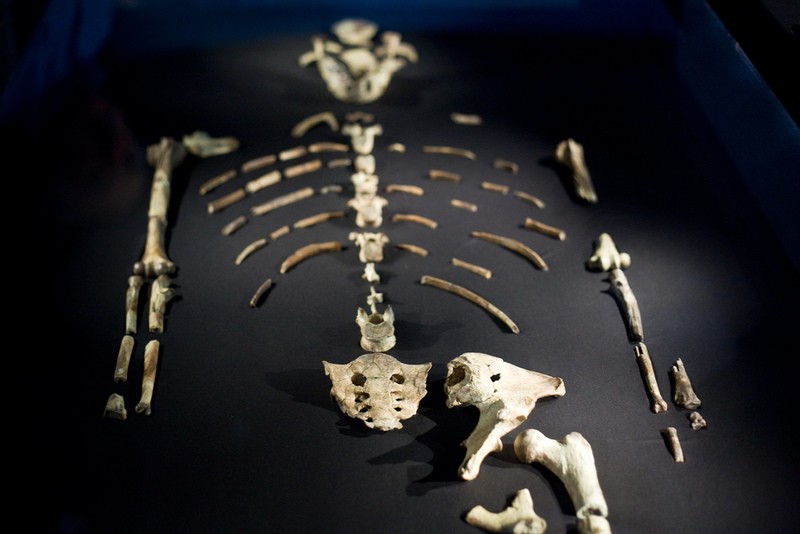 News of the Lucy mission name was welcomed by the team that discovered the famous fossil. "When I first learned of the Lucy mission, during a visit to Bhutan, I was thrilled and overwhelmed with pride," said anthropologist Johanson. "As a teenager, I was very involved in astronomy with a 10-inch Clark refractor telescope at my high school. It is deeply rewarding that more than 40 years after my discovery of Lucy, she continues to play an important role in scientific exploration." So this is how a hit song, inspired by a drawing from a rock star's young son, inspired the name of a fossil human ancestor, which inspired the name of a NASA mission to understand our origins. "We are conscious of all the ways the name we chose for this mission has different cultural meanings," said Keith Noll, project scientist for Lucy at NASA's Goddard Space Flight Center in Greenbelt, Maryland. "If Lucy resonates with someone, brings them in and gets them asking questions, that's just great." Lucy will launch in October 2021 and fly by its targets between 2025 and 2033. In all, Lucy will study six Trojans and one Main Belt asteroid. From 2008: "NASA Beams Beatles' 'Across the Universe' into Space"
From 2005: "Spaceflight Set the Stage for a Story by Sir Paul"